The Bischoff Model ended with great a season, correctly picking 172 games for the 2014 year. Comparing itself for its main peer, Nate Silver’s Elo, it was just 4 games behind with Elo predicting 176 correct games. Microsoft’s Cortana lagged a little behind with only correctly predicting 170 correct games. 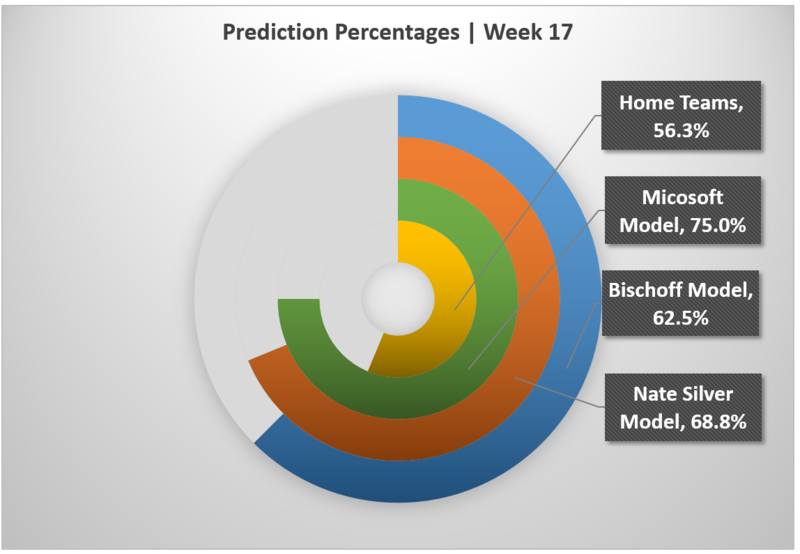 To Cortana’s credit, it did a great job the last 3 weeks, tying the Bischoff model in Week 15 and leading the pack the Week 16 as well as Week 17. Here are the final outcomes of the regular season. I was not planning on going into the playoffs with predictions, however due to everyone’s interest (not that it took much convincing), I figured I’d continue and see how the Bischoff model stood up to the other two models. 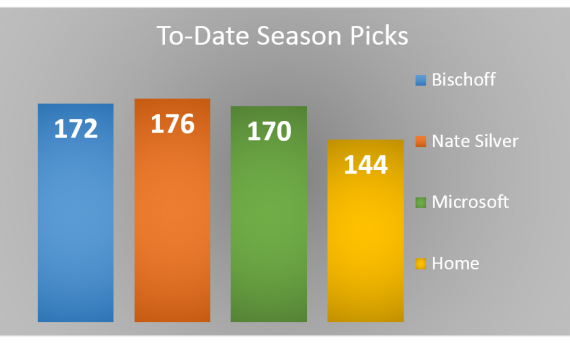 Microsoft’s Cortana and Nate Silver’s Elo agree on all of the games, however the Bischoff model disagrees on the Arizona at Carolina, which is probably due to Arizona’s superb success at the beginning of the year that the Bischoff model is still picking up. Here are the full predictions. Keep up the wonderful work, I read few pages on this site and I think that your site is rattling interesting and holds lots of superb information. I just wanted to jot down a small comment to appreciate you for those marvelous techniques you are posting at this site. My time consuming internet look up has now been recognized with beneficial knowledge to exchange with my companions. I ‘d state that that most of us readers actually are undoubtedly endowed to be in a good network with many outstanding individuals with beneficial ideas. I feel pretty grateful to have come across your entire weblog and look forward to really more awesome moments reading here. Thank you once more for everything.